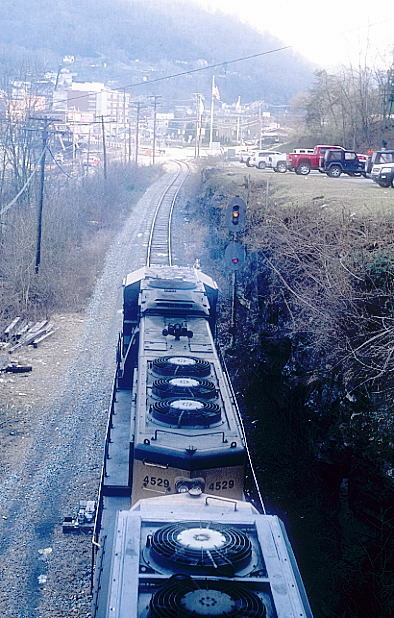 The target of this mission was to shoot the remaining old C&O-era signals in the Logan area before they were eliminated or replaced with state-of-the-art units. Russ Miller alerted me that this work was in progress, so I took off the next available day to get my photos. Friday, February 17 had a good weather forecast. 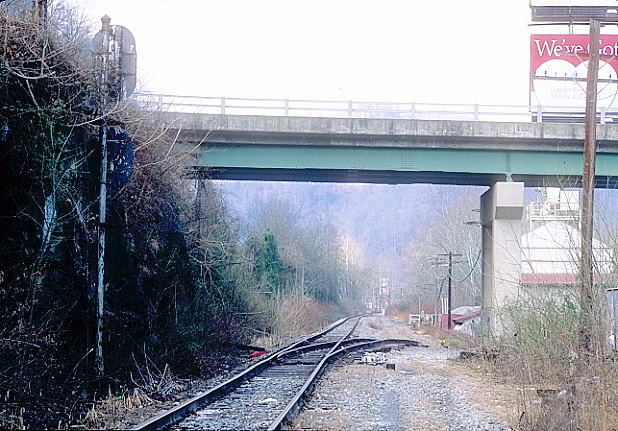 The "Logan Concrete" westbound signal is almost under the WV 10 bridge on the Island Creek Subdivision. 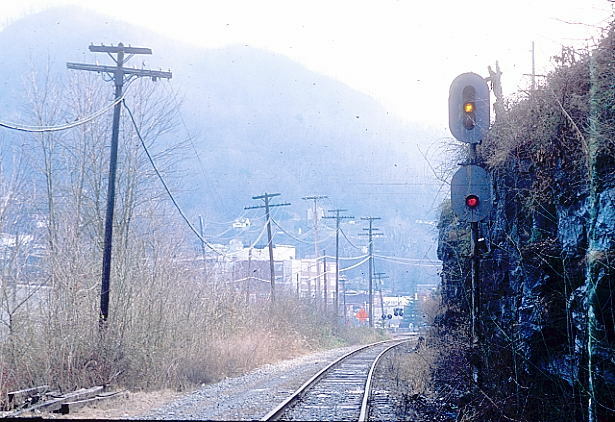 It is the approach signal for the junction and crossovers at FD Cabin which is near the former Logan depot. 1. An "approach" signal is encouraging. There is a train coming. 2. This signal is against the cut, and you would miss it if you didn't know it was there. 3. 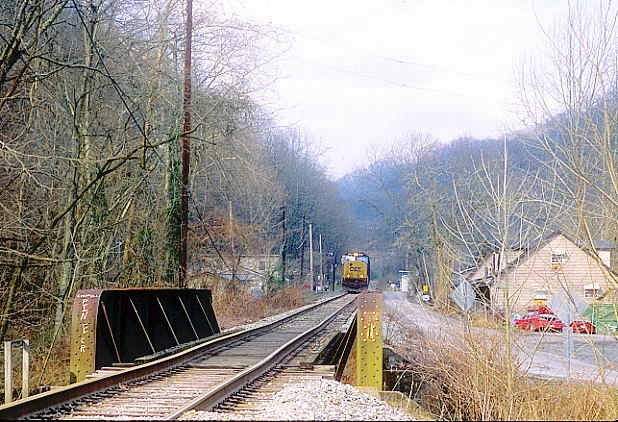 Looking east toward Monitor Jct. That's WV 10 going overhead. 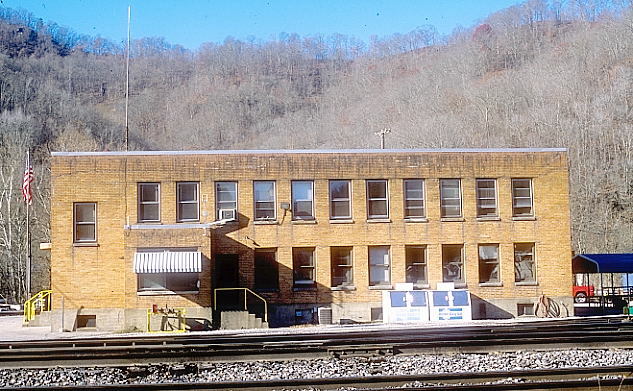 The siding once served Logan Concrete. 4. Having come by Feats tipple at Holden, I knew there was nothing on the Island Creek side. I headed up the Logan & Southern side toward Omar. Rolling into town I heard westbound H813-17 on the radio, and his headlight was in view. 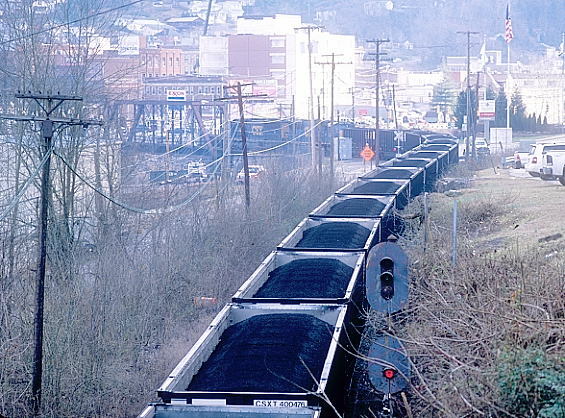 This train of 100 cars loaded at the Holden 22 Mine (formerly Island Creek 22) on Pine Creek. 5. H813-17 westbound at Chauncey. 6. Passing Micco. Micco is an acronym for Main Island Creek Coal Co. that once had a tipple here. 7. 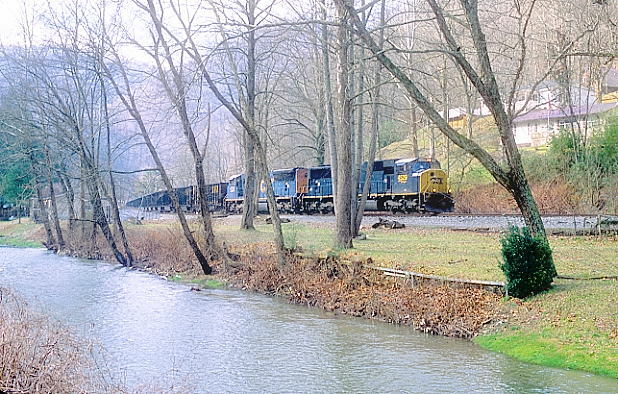 The most scenic location on Main Island Creek is at Switzer. 8. 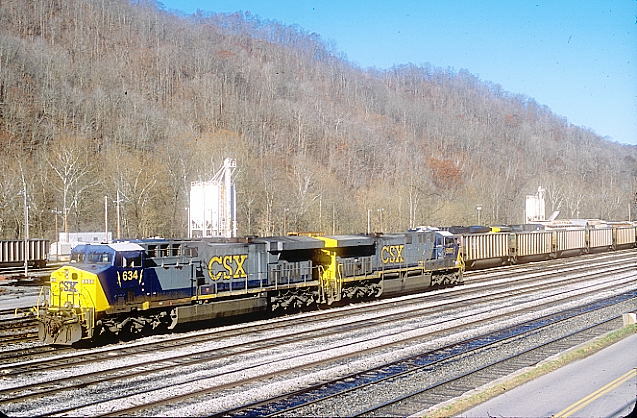 SD70MACs 4529-4764 have just rolled by Monitor Jct. and are looking at "Logan Concrete." 9. In a second H813-17 will "knock down" the signal. 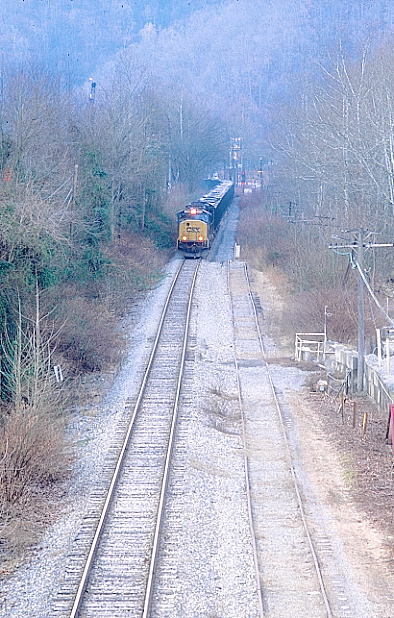 He is already "lined up" to go into Peach Creek Yard. In a minute he will tie up several busy crossings in downtown Logan. 10. 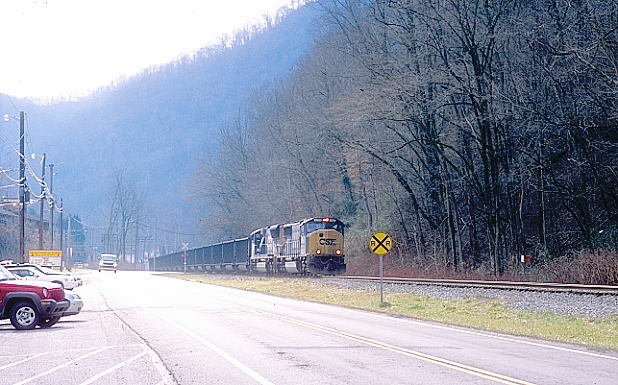 Loganites are used to frequent trains and have learned to tolerate them over the years. 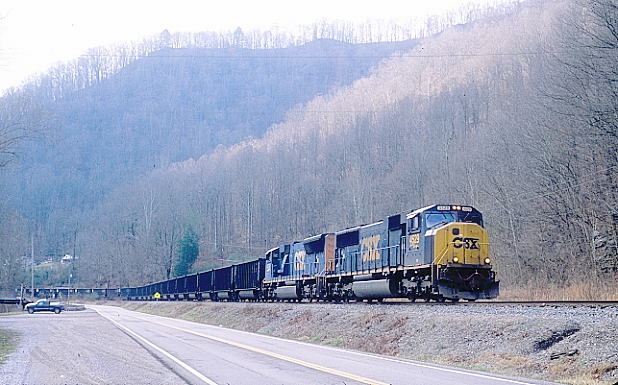 Coal is the lifeblood of the area. 11. These shots at Peach Creek were taken on an earlier trip to Logan and Coal River made on Nov. 18, 2011. AC60CW 634 and 5007 are parked near the yard office. 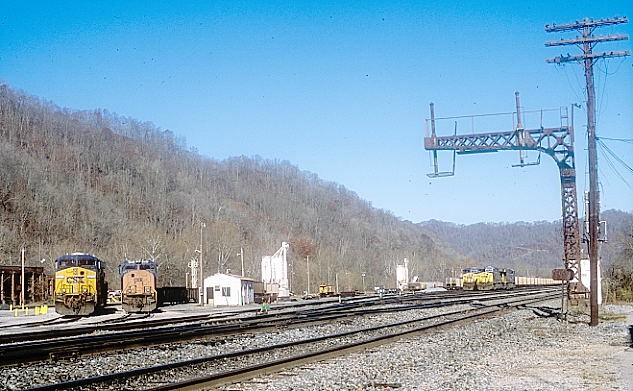 The Trans-flo terminal (mostly bulk explosives) can be seen in the background at the site of the old engine terminal and car repair shop. 12. 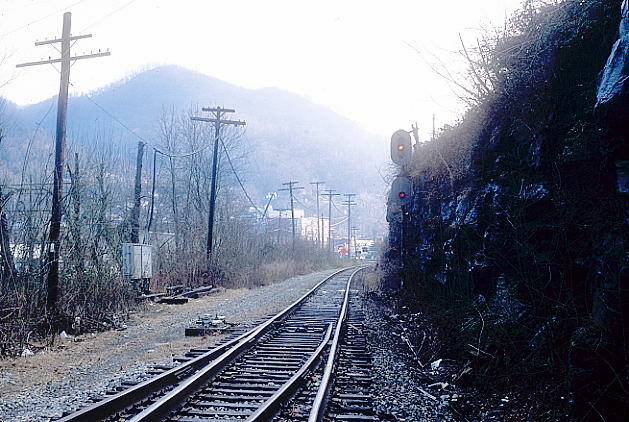 Looking west toward what was formerly called the "loaded" yard where coal trains were made up. Oh what stories that old cantilever could tell! 13. 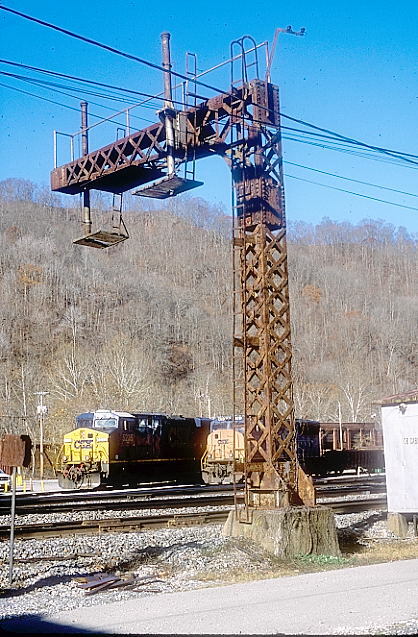 The signals at "OB" were removed several years ago. I suspect the cantilever will come down soon. The empty machine shop is in the background. 14. A broadside view of the Peach Creek yard office with the yardmasters bay. The yardmaster is in Huntington now, and I don't know if there is still a clerk position here. The district still has a trainmaster. During the glory years, Logan District had an assistant superintendent. The district had its own dispatcher here also.